Many business owners and managers are making their organisations more customer-focused by investing time, money, and resources into driving customer engagement and improving customer service. But once you’ve actually taken action, how do you then translate these gains into sales? The good new is there are three simple ways you can increase sales in your business. 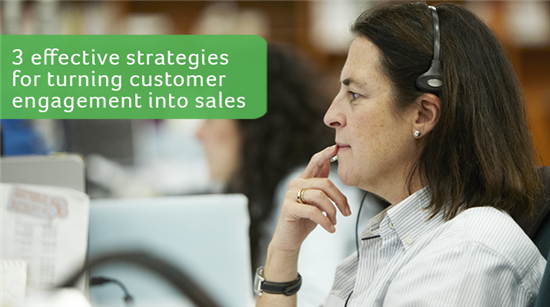 Customer-centric businesses manage their leads like contacts. This personalisation and recognition of value will translate to the customer as a superior customer experience. But, more importantly, it frames every sales opportunity as an investment in tomorrow’s business success—rather than one sale today. The customer’s time is precious, so make sure your salespeople aren’t wasting it by searching for contact information or order history during their sales pitch. Customers will gladly take their business to your more efficient competitors. Having accurate, readily accessible customer information allows your salespeople to actively nurture the customer relationship and focus on the customer’s needs. Whether that’s providing immediate answers to questions or resolving complex issues with supportive data, it results in a more effective, impressive, and satisfying overall sales experience. And that makes customers more likely to bring their business back to you. While priorities may change as a business grows, one remains constant: profitable growth. For some that means improving sales initiatives; for others it’s boosting marketing strategies or managing prospect information. Technology solutions like CRM collect valuable data from customer interactions and make them visible and accessible to the company as whole. This enables greater collaboration and empowers each team—from managers to sales, marketing, and customer service—to learn what customers need and translate that information into smarter, faster decisions for growth. Need help generation leads? Read this. A customer-centric business is driven by information—the better your information, the easier it is to parlay that into strategies that can close a sale. CRM solutions are the real key to success here: not only does CRM increase visibility and company-wide access to information, it also enables sales teams to use analytics to improve lead generation and tracking, better create targeted marketing campaigns, and personalise their sales opportunities. Integrating CRM with your accountancy and business management software maximises this access by providing one centralised view of your business. This ensures that customer focus drives all strategies from one end of the business to the other—as well as from initial lead to close of sale.